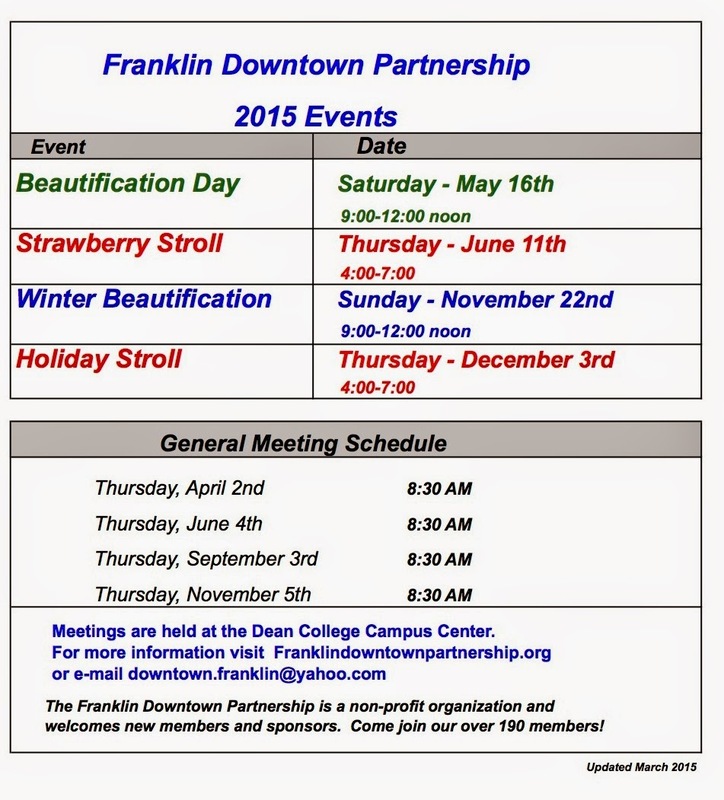 The Franklin Downtown Partnership has set its 2015 dates for the Strawberry Stroll, Holiday Stroll, and Beautification days. The Partnership also announces its General Meeting dates and invites the public to attend and learn more about important changes coming to downtown Franklin. The event schedule looks different this year because the FDP has put the Harvest Festival on hold due to the upcoming Streetscape revitalization project. The scheduled reconstruction of roadways and sidewalks and pedestrian safety were the main factors in the Partnership’s decision to postpone the festival until 2016. Downtown Beautification Day will be Saturday, May 16, 9:00 a.m. to Noon. The Partnership, the Franklin Garden Club and numerous volunteers wielding spades and garden gloves will install hundreds of flowers and greens throughout downtown and on the Common. Community service hours will be available to students. Contact Eileen Mason, emason11@verizon.net, for more information about the event, volunteer and sponsorship opportunities. Winter Beautification Day will be Sunday, November 22. The 12th annual Strawberry Stroll is will take place downtown on Thursday, June 11, from 4:00 – 7:00 p.m. Come celebrate summer with the Partnership’s scrumptious Strawberry Shortcakes while enjoying live entertainment and a sidewalk sale. If you would like to sponsor or participate in this event please contact event Co-chair Nicole Fortier, nfortier@deanbank.com. The always-popular Holiday Stroll will be Thursday, December 3, 4:00 – 7:00 p.m. This special holiday celebration will include a visit from Santa and his elves, live entertainment, food and drink specials, crafts and gift shopping. Gregg Chalk and Roberta Trahan will co-chair this festive event. The Partnership invites business owners and interested residents to participate in its General Meetings on June 4, September 3 and November 5. Come learn more about issues affecting downtown Franklin. The meetings are held at 8:30 a.m. at the Dean College Campus Center. More information about each event, meeting sponsorship and volunteer opportunities can be found at www.franklindowntownpartnership.org, on Facebook at www.facebook.com/FranklinDowntownPartnership.org, or on Twitter at @FranklinDowntwn. The Franklin Downtown Partnership is a nonprofit, 501©3 organization made up of business owners, community leaders and residents working together to stimulate economic development downtown and create a positive impact throughout the area. The FDP currently has over 200 members and welcomes all businesses and residents. For more information, please contact Executive Director Lisa Piana at (774)571-3109 or downtown.franklin@yahoo.com. Click here to download and print the 2015 Events, Meetings Press Release.